So what happens when a soldier fires his heavy pistol against a starship you ask. Well, let's find out! By the way, this post is part of the series of posts I am making about the development of my next game: Solar Blades & Cosmic Spells. Although both a soldier and starfighter can carry laser weapons that deal 1d6 points of damage, these damage points are in a different Scales. Usually, a starship fire its weapons at another starship. A character attacks another characters. But what happens when a character fires its gun against a war tank? And what happens when that war machine fires back? There are 4 Scale categories: Personal, Vehicle, Starship, and Space Station. Personal is the scale of characters, NPCs and most monsters and aliens they interact with, as well as most personal vehicles, fit for about 4 to 6 people. Vehicle is the scale of most planet bound vehicles that are not personal, like tanks, helicopters, planes, ships and others. Starship scale encompasses starships of almost any size, from starfighters to most capital ships. Finally, the Space Station scale includes anything bigger than most capital ships, including space stations and minor planetoids. In general terms, a attack from a smaller Scale combatant against a larger Scale one is easier to hit but causes less damage. Alternatively, when a combatant from a larger Scale attacks one from a smaller Scale, he has a hard time hitting it, but inflicts a lot of damage. The effects in game terms are summarized below. A combatant attacking a enemy at least 2 categories of Scale larger than himself receives a Positive Die on attacks (Personal attacking Starship, or Vehicle attacking Space Station). On the other hand, armor provides double the amount of Damage Reduction for each category the defender is larger than the attacker (a war tank with heavy armor has 6 points of Damage Reduction when attacked by a soldier with a rifle, and a starship with light armor has 4 points of Damage Reduction against the same soldier). A group of mercenaries in service of a local crime lord arrives just as the Crimson Nebula is taking off. The crew owes money to them, but having spent everything they had to repair the ship, they cannot pay him. So the mercenaries open fire against the ship. Thankfully, their guns are in Personal scale, thus the light armor of their ship absorbs 4 points of damage! 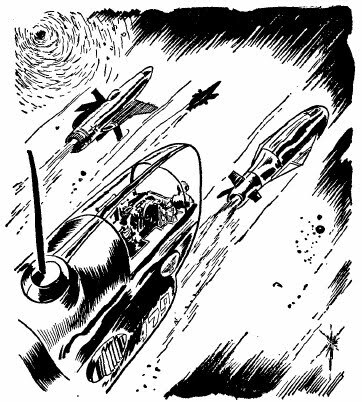 A combatant attacking an enemy at least 2 categories of Scale smaller than themselves receives a Negative Die on attacks (Starship attacking Personal, or Space Station attacking Vehicle). On the other hand, damage is doubled by each category the attacker is larger than the target. So a heavy laser fired from a starfighter against a war tank would inflict 2d6+2 points of damage, and 3d6+3 points against a soldier. On a different occasion, Kaylia and her friends were exploring the ruins of an alien city in the purple planet of Aghas when a bomber ship flew by, firing at them. Being such a small target for the starship, however, the Overlord rolled the attacks with a Negative Die. Luckily no one was hit, since the damage would be quite deadly!